The 10 Mark Prussia Wilhelm II. gold coins date from the time of the German Empire. They were published under Wilhelm I., who reigned from 1888 to 1913 as an emperor, and were legal tender in daily circulation. The Kingdom of Prussia was the largest and most influential single state of the German Empire, with two-thirds of the area and about three-fifths of the population. These historic 10 Mark gold coins were produced in the fineness 900/1000. An alloy of 10 percent copper increases the resistance and scratch resistance of these gold coins, meaning they are still in very good condition today. The 10 Mark Wilhelm II. gold coins have a fine weight of 3.58 grams of gold, a thickness of 0.9 mm and a diameter of 19.5 mm. The front of the 10 Mark Wilhelm II. 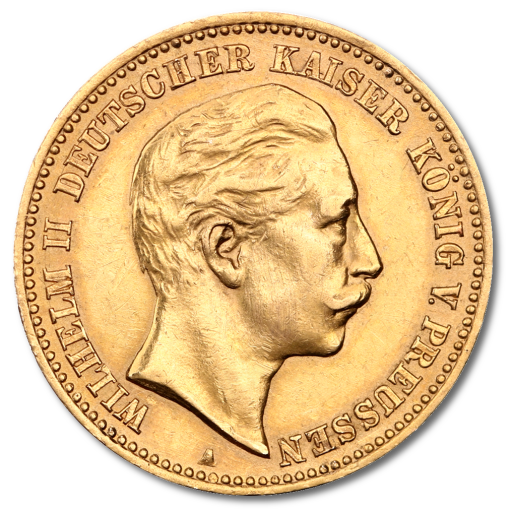 gold coin shows a portrait of Kaiser Wilhelm II., bareheaded, facing right, and surrounded by the following inscriptions: "Wilhelm", "Deutscher Kaiser" and "König von Preussen"
The back of the coin shows the imperial eagle with shield, surrounded by the inscriptions: "Deutsches Reich", the year of issue and "10 Mark" (the nominal value). 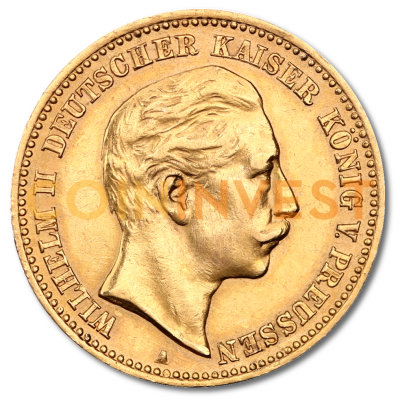 Even 120 years and multiple currency reforms later, the 10 Mark Prussia Wilhelm I. gold coin has kept its value and is a globally popular collector's coin, which also has a lot to do with the material from which it was minted.